The automotive industry is undergoing the biggest transformation in its history. Megatrends such as digitisation, autonomous driving and e-mobility have significant implications not only for manufacturers but also for suppliers. What is required are smart production and logistics systems that combine modularity and intelligent automation to enable extreme flexibility so they can be quickly adapted to evolving requirements and the ever-increasing demand for greater type variety, more frequent changes of model and strongly fluctuating batch sizes. As one of the world’s leading suppliers of production systems for the automotive industry, KUKA offers bundled expertise in engineering, project management, testing, process knowledge and service. With its future-oriented solutions, KUKA is systematically leading its customers towards Industry 4.0. At the Motek 2018 trade fair in Stuttgart, the automation specialist will present examples from its broad range of products for the world of automation, particularly various Industry 4.0 solutions. How can different parts be produced on a single system? How can production be stepped up on short notice? How can conversion for a model change be carried out within a short period of time on the same system? 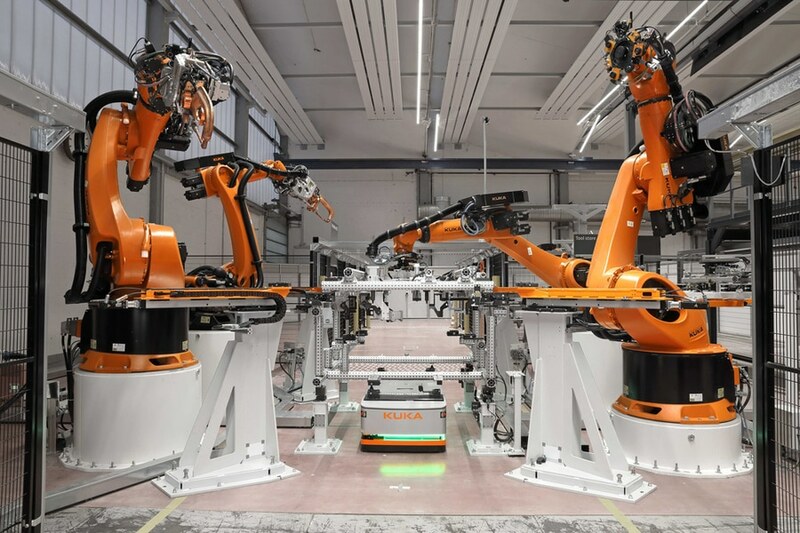 In matrix production, KUKA has created a smart, flexible and extremely versatile production solution that has been in operation at the Augsburg site of the system and machine builder since March 2018. This generic production facility is centred on the KUKA SmartProduction_control software package, which incorporates artificial intelligence (AI) technologies in combination with automated guided vehicles (AGVs). A key advantage lies in the separation of production and intralogistics. Controlled by KUKA SmartProduction_control, the AGVs fetch tools from a tool store and then transport them to the production cells in which they are required. All cells are equipped with product-independent basic functions and can be simply expanded with product-specific tools depending on the level of orders and batch sizes. At the same time, the AGVs move to the centralised material warehouse, which is decoupled from production, in order to transfer the centrally stored components needed for the production process into the cells. Matrix production can thus provide a significant competitive advantage compared with rigidly linked production concepts. SmartProduction can also offer added value in the field of electromobility, for example. With manufacturers announcing a wave of new electric vehicles (EVs) for the coming years, the threshold to the mass market has been passed, posing new challenges to suppliers. The production of battery cells, modules and packs is highly complex and the involved technical processes are extremely challenging. To satisfy the increasing demand for electromobility, automakers are calling for intelligent, automated systems and experienced suppliers for the cost-effective production of batteries for electric vehicles. KUKA provides solutions and expertise for every single step of the process chain. Beyond module and pack assembly lines, KUKA also offers friction welding equipment used in the production of battery contacts or battery housings, as well as robotic systems used to fit or extrude seals, for example. Its portfolio also includes final quality control in the form of a leak test and installation of the battery packs in the vehicle. Such close collaboration between the mechanical engineering sector and the automotive industry results in synergies for efficient and innovative battery production solutions. In the future, robots will support people in a wide range of everyday activities, including autonomous driving. 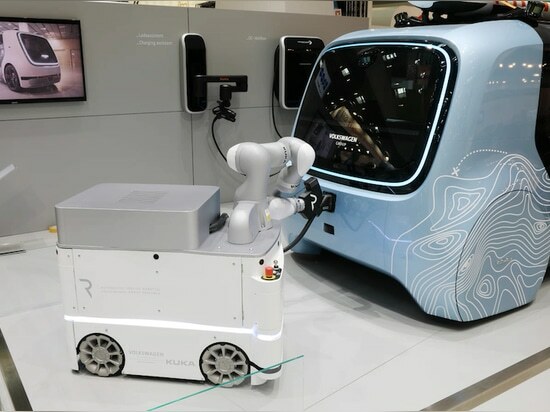 In a research cooperation venture with Volkswagen, KUKA is developing robot-based innovation concepts for electrically powered and self-driving cars. 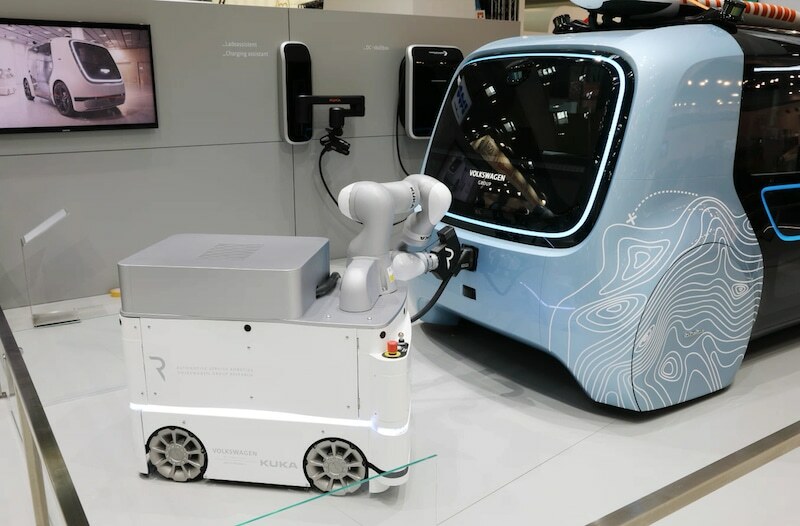 In the e-smart Connect project, CarLA – a mobile robotic charging device – automatically connects an e-vehicle to a charging station: the car simply needs to be parked in a designated parking space and the charging cable is connected by the mechanical assistant. The passenger of a self-driving vehicle can get out of the vehicle before it drives to a charging station. The automobile independently finds a free charging station, where it is charged by the service robot. KUKA has expanded its product portfolio with a new member of the ready2_use team called ready2_rivet. The self-pierce riveting solution for body-in-white (BiW) applications has been developed jointly with Böllhoff, one of the world’s leading manufacturers and suppliers of fasteners and assembly systems. “The combination is the key,” says KUKA project development manager Burkhard Stimmel. “Using the KUKA robot and controller paired with the expertise in mechanical joining technology of our partner Böllhoff, we were able to develop an automated, flexible and turnkey solution for BiW applications.” Customers benefit from the low effort required to integrate the self-pierce riveting application and from its versatility. Ready2_rivet’s KR QUANTEC series robot is from KUKA, as is the robot controller. Böllhoff provides the self-pierce riveting technology. The KUKA KR C4 robot controller convinces with its worldwide compatibility: it works reliably with different mains voltages and types, even in extreme cold, heat or humidity. It speaks 25 languages – including the major Asian ones – and meets all globally relevant ISO and US standards. 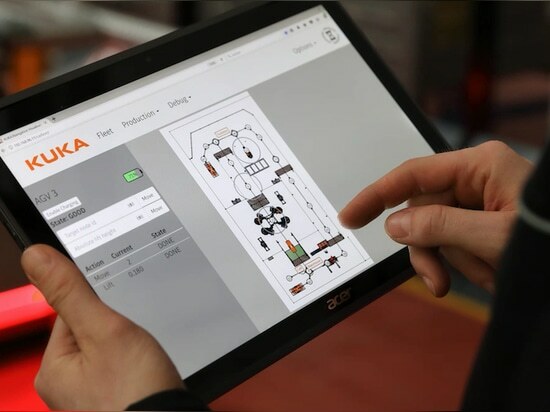 The KUKA smartPAD makes operator control easy and intuitive, even for inexperienced users. 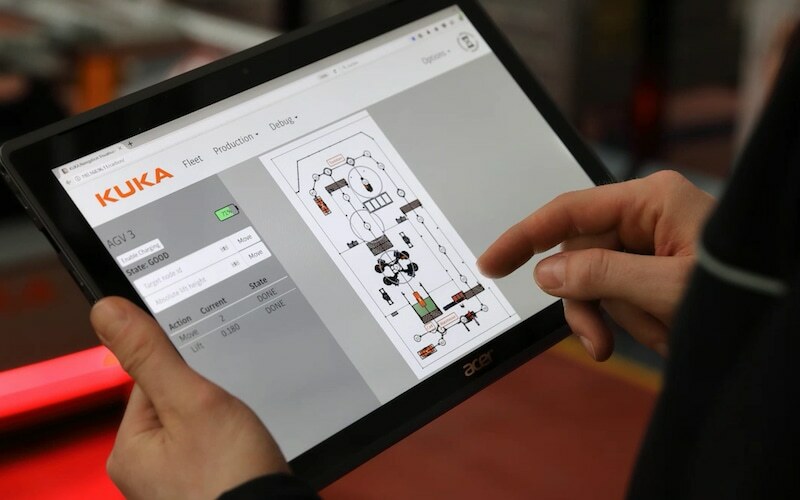 In this case, the KUKA smartPAD also serves to simplify operator control and supports the process control of the overall system. Böllhoff provides the application components, the expert for mechanical joining technology using its tried-and-tested self-pierce riveting process for joints that are accessible from both sides. “Lightweight construction in the automotive industry demands modern joining technologies,” says Horst Wittop from Böllhoff. “With our process, we set the rivets in a single operation without drilling pilot holes. 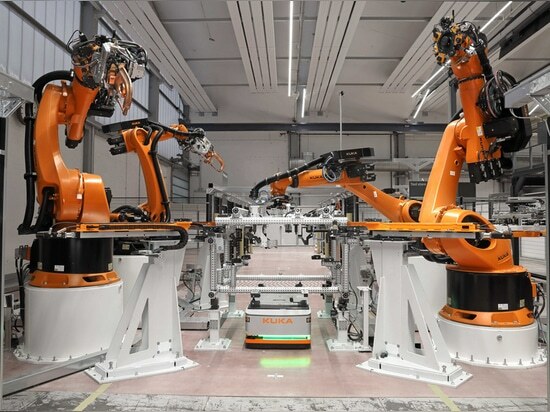 Together with KUKA, we were able to implement perfectly coordinated components.” Both companies contributed their industry know-how in the automotive sector and their respective expertise in robotic and joining technology to bring a competitive product – the ready2_rivet package – to market. Manufacturing in production shops is undergoing a transformation. The reason for this is the increasing international competition and changing market demand. Product life cycles are becoming shorter. This naturally also applies to the automotive sector. Changing model series require solutions that are flexible and quick to put into operation. Lightweight construction, the technology of the future for saving materials and energy, calls for specialist expertise. If, for example, aluminium and steel are to be joined, factors such as the respective strengths of the materials and their deformation characteristics play an important role. Ready2_rivet is the answer to these challenges. The self-pierce riveting application can be seamlessly integrated into the existing production environment and boosts productivity and efficiency. It remains versatile at all times and can be adapted to new requirements – in keeping with the philosophy of Industry 4.0.